Looking for the Best Headphone Stands? Today, there are hundreds of headphone stands available. Just a short time ago, that wasn’t the case. 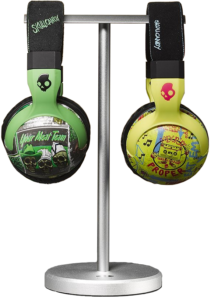 An exploding market for premium headphones has emerged, with products designed for gamers. If you have headphones, you need a place to store them. Are you shoving headphones around your desk? Find out what makes the best headphone stand. Headphone stands are also great little holders for your VR headset that is if you can swing one. While many of the stands in our list are all great stands, there are some great custom made ones as well. Check out some of the great designs LedPuu has come up with on his Etsy account if you’re looking for something a bit more custom! The four main food groups that make for a great headphone stand are stability, materials, construction, and aesthetics. Let’s get started in breaking down some of these and they make for a great headphone stand. The coolest headset stand on the market isn’t worth much if it falls over every time you sneeze. Regardless of price, this is the most important consideration. A headset stand that can’t do its job under normal use isn’t worth the money at any price. But, if you have a headset stand that will stay put during an earthquake, you have a headphone stand that’s worth every penny. Most headphone stands consist of plastic, silicone, wood, or metal. The qualities of each material affect the strength and durability of the product being reviewed. Acrylic and ABS are the two most common types of plastic currently used in headphone stands. Acrylic is ubiquitous. It is cheap to manufacture and is not as durable as other kinds of plastic. If you’re easy on your gear, acrylic will do. ABS, or Acrylonitrile Butadiene Styrene, is used in automobiles and children’s toys. 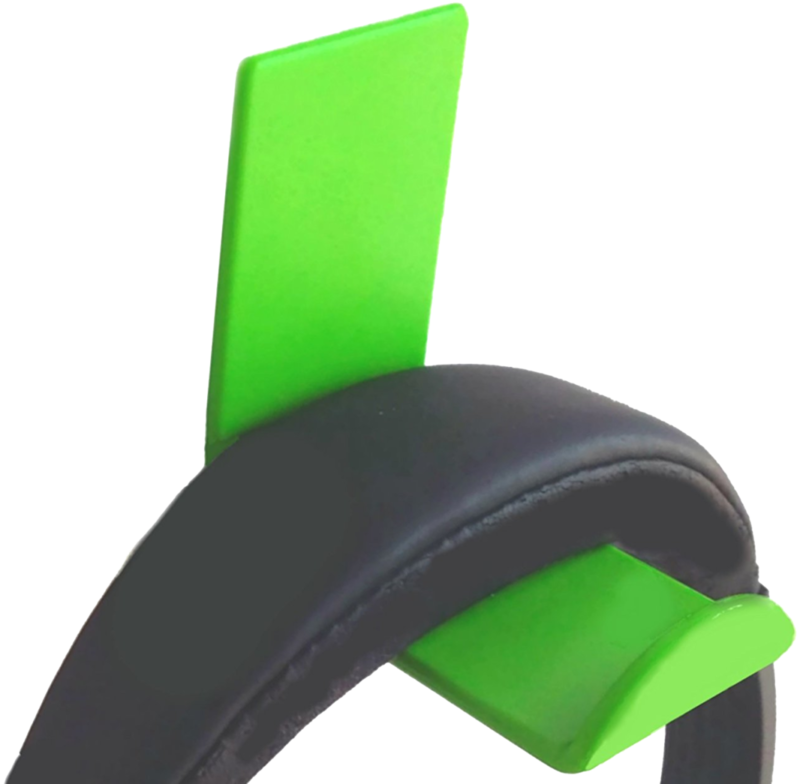 ABS is for you if you need a rugged, durable headset stand. This wonder material possesses characteristics common to both plastic and glass. These qualities make it a durable, flexible material. It is heat-resistant and impervious to nearly anything you might spill. As such, silicone makes a perfect material for headphone stands. Indeed, it can withstand just about anything short of a nuclear disaster. A versatile material, wood has innate beauty and durability. To make a product even stronger, some manufacturers use laminated wood. Although, this material consists of thin layers of wood that are glued together, then pressed and cured. This wood product can then be shaped with steam as it is pressed on a form. 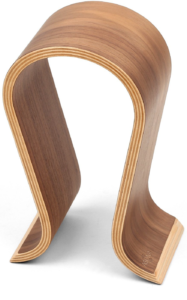 Laminated wood makes a particularly strong and durable headset stand. 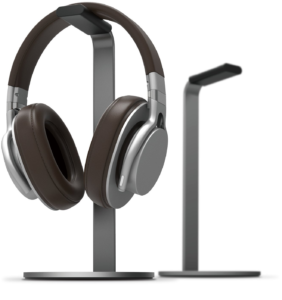 Metal is the material of choice for most of the headphone stands reviewed. Therefore, the metal of choice: aluminum. Used in everything from toys to commercial aircraft, aluminum is lightweight, strong and easy to machine. The nature of aluminum makes it a great candidate for the popular diamond-cut finish. This is a process where an ultra-precise lathing tool removes tiny amounts of the aluminum, leaving a lustrous finish that is scratch-resistant and durable. Aluminum is also perfect for anodizing, an electrochemical process that creates a layer of oxidized aluminum. This matte-like finish is extremely durable and scratch-resistant. How a headset stand is put together makes a huge difference in how strong and durable it is. The last thing you want is a headset stand the falls apart every time it gets knocked over. One-piece construction usually consists of an item formed by molding. One-piece molded headphone stands are almost always made from plastic, with acrylic being the most popular. This type of construction involves distinct parts or components that must be assembled. The way they are put together has a lot to do with how sturdy and durable a product is. Snap-together construction is popular with the cheapest plastic headset holders. It is also the least durable. A much more durable type of construction utilizes fasteners, such as screws. Most of the metal headset stands are fastened together with screws. This makes them strong and much more durable than their snap-together counterparts. Beauty is in the eye of the beholder, and so it is with these headphone stands. When it’s all said and done, we like to surround ourselves with things we think look cool or beautiful. I am not worthy to tread upon this minefield of taste. You must judge for yourself that which is beautiful. While contemplating that, check out the best headphone stands for under $20. Made with a white plastic base and a silver centerpiece that supports a white rubber pad at the top, this headset stand is designed to gently hold your headphones. This product requires snap-together assembly with no need for any tools. With a feathery weight of only 0.2 ounces and a small base, it’s not very stable. A quick grab or even bumping against the desk may knock it over. You can remedy this with a paperweight or similar object. If you have large headphones, you may find the wires pinching where they terminate at the ear cups due to dragging against the desktop. For a lightweight pair of headphones, this is an adequate product. If you have large or heavy headphones, you may want to look at other options. For the serious gamer with a tight budget, this headset stand looks great and gets the job done. 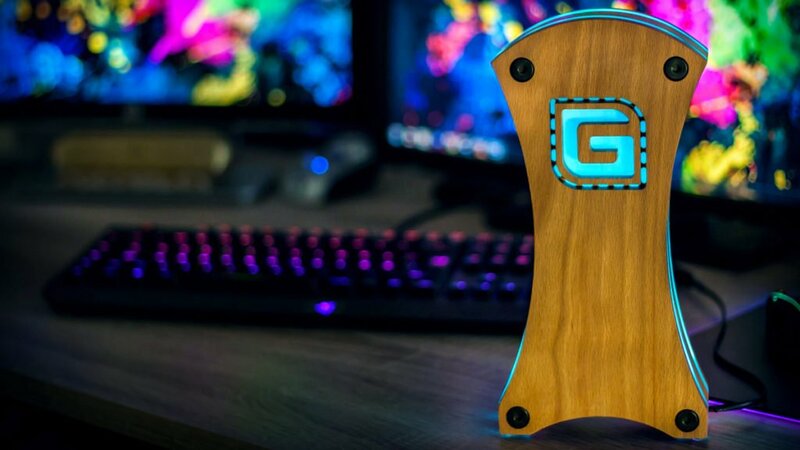 Made from lightweight plastic, this desktop model is a great match for any gaming setup. The model fits all headphone sizes, with storage for your headphone cord. It’s solid, stable, and easy to use. For added convenience, this model has a smartphone holder that fits iPhones and other smaller smartphone models. Great value for the price. Made from ABS plastic, the same plastic used by the automobile industry, these are tough. Each hook comes with 3M’s famous Command mounting strips, a damage-free, stain-free adhesive with superior strength. When installed, these bad-boy hooks can safely hold up to 5lbs! Even the heaviest set of headphones will be safe and secure on this hook. The only thing that isn’t great about this product is the price–they are a little more than a certain durable, molded plastic desktop headphone stand. Still, if just need a heavy-duty headphone hook and some new coat hooks, these are the ticket. While made by the same company that makes Sades headphones, this product has the most aggressive design. 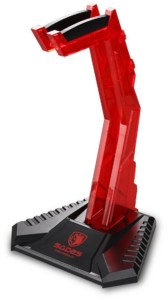 Its rugged-looking black base contrasts with the bright red ‘cradle’ (arm? ), making a bold statement about your gaming style. The E-sports one ships disassembled, so you must snap it together before using it. While it looks rugged, there are complaints that this stand can come apart, especially if it happens to get knocked over. At 8.8 ounces, it is on the light side, especially for heavier headphones. If you have light headphones, this headphone cradle may be worth a shot. Otherwise, you may want to look for something a little heavier with sturdier construction. In the Heavyweight category, we have a winner! Breaking the scales at 1.4lbs, this headset holder is easily the victor. It ain’t pretty, but it has solid features. Made from solid aluminum components, this headset holder will hold your headphones forever. 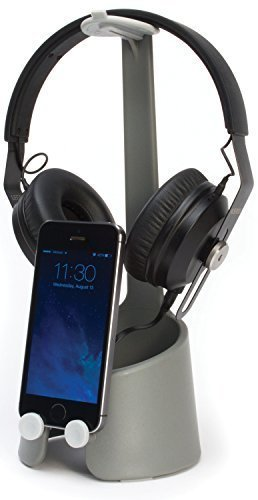 The large heavy base makes the stand virtually immovable, while the large curved bar at the top stores your headphones without deforming the headbands. The anodized finish will resist scratches for years to come. While it won’t win any beauty contests, this headset holder might just be the best bang for the buck. The only headset stand with a USB hub, this model offers three USB3.0 ports and a 3.5mm headphone jack to plug into, with backward compatibility to USB 2.0. It also includes a 3-foot USB cable to plug into your gaming rig. While not self-powered, it does provide a convenient place to plug your headphones and other peripherals into. Dropping in at 1.2lbs, its weight and large, round base make it virtually impossible to tip over, the desired quality in any respectable headset stand. A durable product that fits nearly any set of headphones available, and offers a feature none of the others have. One caveat: it’s not compatible with iPhones or iPads. For gamers who must have iPhone or iPad compatibility, this model may not be for you. For the rest, it’s a worthy purchase. This one’s a beauty! With precision-machined edges and a diamond-cut finish, this headset stand looks like it should be selling for a whole lot more than its current retail price. The slender profile belies a hefty 1.2lbs. Combined with non-marring, non-slip rubber feet, this baby’s not going anywhere you don’t want it to. Additionally, the thoughtfully placed pad on the hook will also protect even your most cherished set of headphones. A little more expensive, but worth every penny. Wood has a look and feel that metal can’t touch, and ASONA delivers on both. 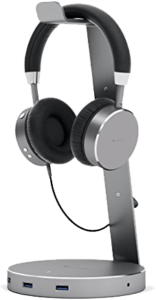 The head-shaped design was carefully engineered to hold virtually any set of headphones without stressing the headbands. This stand is made from a laminated plywood construction consisting of alternating light and dark layers of wood. A brown walnut veneer adds the finishing touch. Weighing in at exactly 1lb, it’s sturdy and stable. While moderately priced, it’s still affordable, and worth every dime. This headphone stand looks great and is also made out of metal. 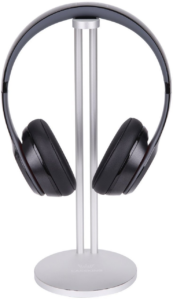 Standing at 10-½”, it will fit nearly any set of headphones you can hang on it. A silicone pad on top protects the headphones, while a silicone pad on the bottom helps to keep this stand in place without marring the desktop surface. Not as heavy as some, it still does what it’s supposed to–store your headphones on a solid, sturdy base. A little on the pricey side for what it is, I would take a second look at comparable headphone stands that cost less. Another all-metal contender, this headphone holder really fits the bill. 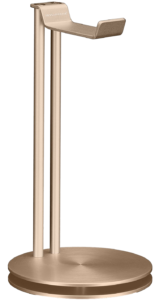 With a design inspired by their own award-winning X-Stand for the iPhone, Just Mobile created another sleek, durable product that is standing the test of time. The Just Mobile Headstand for Headphones has a rubber pad on the bottom to prevent it from slipping around the desktop and marring it. Hang your headphones without a worry on this headset stand. While it is a worthy product, the price is a little north of the competition. Similar all-metal designs can be purchased for as little as half the average retail price of this product. The offering from CASEKING sports a little different design, one with a single hook instead of double. Made with the same aluminum alloy components, this headset stand is just as solid as its double-bracket brother. If you need only a single bracket, this one will save you several dollars off the cost of its brother. We’re just a few days into 2019, so it’s difficult to predict what other great products will come along. There are hundreds of headphone storage products entering the market, from the super cheap to the uber cool. Keep your eyes peeled, and if you happen to find something awesome, tell us about it!